Today’s Write 31 Days prompt is: HAIKU. I write all the things. 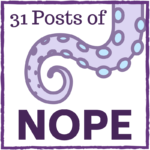 This entry was posted in Blogging challenge, General, October, Poetry, Post of Nope, Self care, Write 31 Days, Writers block, Writing challenge. Bookmark the permalink. I can relate. My goal is to work on a memoir (for posterity), and now I’m totally involved in this 31 Day Challenge, writing every day (! ), but am I really just avoiding serious writing?! I think maybe writing begets more writing. It’s like alphabet bunnies getting busy and suddenly the blog is full of goodness and there’s somehow a book sitting on the coffee table. At least, I hope it is.